Transform yourself into the lead character with our Fantasma dell'opera craquele - Phantom of the Opera Italian Venetian Masks. 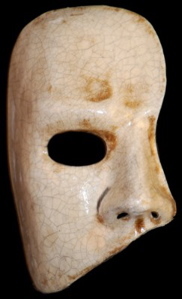 Our Phantom masquerade masks are true to the original novel and feature an asymmetrical vertical half mask painted with bone colored craquele paint. To create depth, our mask makers in Venice, Italy add translucent dark gel paint in the natural shadows of the mask. 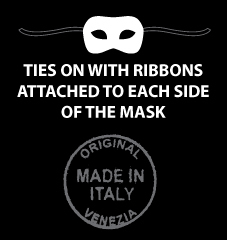 As a final element, our Venetian masks, have ribbons on the sides to create a snug fit. Select our phantom masquerade masks to wear as you attend the Phantom of the Opera play, or with formal wear to a masquerade ball. Create your own unique masquerade costume by adding a black, red, or white hooded cloak made by Venetian Mask Society.